Ever wondered how you could get the most out of Redbooth and Evernote? Use them together! 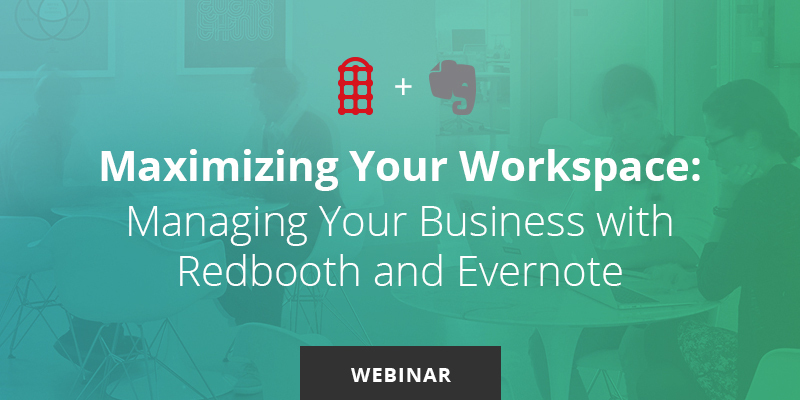 And Evernote’s recent webinar, “Maximizing Your Workspace: Managing Your Business With Our Redbooth Integration,” shows you exactly how. Hosted by Christopher Lopez, Account Executive on the Evernote Business Team, the webinar walks viewers through an introduction to Redbooth and a demonstration of how to use Redbooth and Evernote together to achieve powerful results. Because the content that teams collaborate on is often located in multiple places, Charles added, it’s important to Redbooth to partner with companies like Evernote. That way, teams can use the notetaking and file-sharing sources they already love and trust — and leverage them to work together more effectively. Find out how the Redbooth-Evernote integration works for all different kinds of teams and workspaces, including teams that expand beyond departmental boundaries. See how to drive accountability and visibility with simple settings inside Redbooth tasks. See how to access your Evernote notebooks and find your notes so you can embed them inside relevant workspaces. Watch how the process progresses in real time from an informal chat in workspace messaging (including linked Evernote notes) to capturing a great idea and turning it into a task — all the way through developing a creative concept and moving an initiative forward. What happens if some Redbooth users have Evernote and some don’t? Can they still view embedded Evernote notes? How can Redbooth users manage multiple customer or client engagements? We want access to the most recent release of Redbooth. How soon can we get it? For more answers, you can also see how a busy design firm increased efficiency by using Redbooth and Evernote together and learn more about the Redbooth-Evernote integration. If you have additional questions, feel free to tweet @RedboothSupport or email help@redbooth.com. Ready to get started? Watch the full video now, no registration required!